Summer solstice 2012 happened just a few days ago here in the Northern Hemisphere (21.6.2012). It means that the days are getting shorter and nights are getting longer again. It also means the change of observing season for me, the moment of summer solstice is the boundary between the seasons for me, and thus it’s now a good time to reflect the season that just ended. 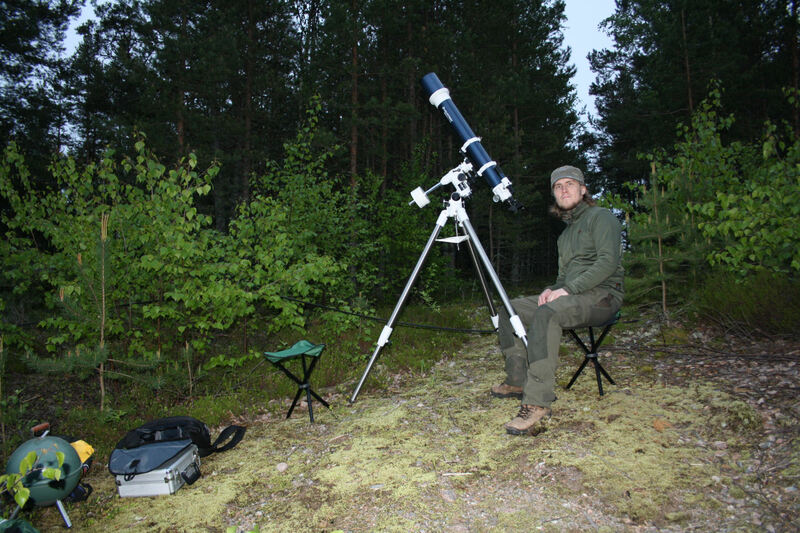 I started my observing season in the Cygnus -summer meeting of Ursa, which was organized 21.-24.7.2011 in Jokioinen, Region of Kanta-Häme, Finland. The date of my first observing session was between 22.-23.7.2011. It was an early start for a season for me, but the season also ended early. The date of my last season was 6.-7.3.2012. I’ll explain later, why it was like this. During the season, I was travelling a lot (for work). This made the season different from the previous ones, when I had been observing mostly in Stormälö, Parainen. During this season, my main observing place was the neighbourhood of Kaanaanmaa, in town of Sodankylä, Lappland Region, Finland. Besides that, I made lot’s of observations in temporary observing places all over northern Finland. During the just ended season, I observed mostly variable stars. There are two main reasons for that: 1. the increase of my interest in observing them, 2. the lack of opportunities for observing in a good, dark sky site. 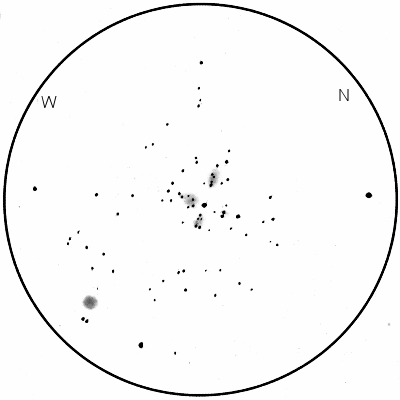 My main observing site in Sodankylä town was rather light polluted – but it was still possible to observe variable stars there. Doing meaningful observations of deep sky objects there was nevertheless almost impossible. Nevertheless, I did also some deep sky -sketches, of which you can see example in picture 1. Closest good dark sky site was located 15 km north of Sodankylä town close to village of Kersilö. The Kersilö observing place couldn’t be much more closer to perfection – it was really a dark place with really open horizon to every direction and easily accessible! The place was much like my observing place in the Stormälö island in the Archipelago of Turku. The place in Kersilö was also a gravel pit – only the use of the pit was different – in Kersilö the pit was a gravel quarry still in somewhat active use, whereas in Stormälö the pit is a motocross -track. Unfortunately I wasn’t able to observe there in Kersilö as much as I would have wanted to because of my work. And then few words about why my observing season ended so early. The main reason for early end was the increase in my interest in atmospherical phenomenae like aurora borealis. In late February and early March 2012 there was aurorae in the sky of Sodankylä during many nights. During those times I made the decision to by my first SRL -camera, Canon EOS 1000D for photographing the aurorae. Then the focus of my hobby was slipped from variable stars to aurorae and other atmospheric phenomenae. Then I decided to end the observing season (of the dark sky objects) and to fully focus on observing and photographing aurorae. During the season, I was mostly observing in rather poor, and cold conditions. The average SQM of the season was 19,5 and average NELM was 5,43. The best SQM that I measured was 21,45 which I recorded during one night during the change of month between September and October in Torinkylä, Sotkamo, Kainuu Region, Finland. The best NELM that I estimated was 6,9 and it happened during one really dark night without aurorae in my Kersilö site close to Sodankylä. I produced the value of SQM with following procedure: I measured SQM three times in a row from zenith and then averaged those numbers. During one session, I might have done several measurements like this, if that was the case I just picked the best average for the value of SQM for that session. The way how I did estimate the NELM was like this: I draw all the stars that I could see in the vicinity of Ursa Minor to a paper – and then checked the magnitudes of the most faintest one that I had drawn – that gave me the value of NELM for that session. During the season, coldness and aurorae were making observing difficult during many nights. The coldest temperature where I was observing was -23 °C, warmest was +14 °C and the average was -6,21 °C. The snow came 16.11.2011 in Sodankylä, and the observing season ended well before the melting of the snow. Aurorae were flickering in the sky during 14 nights. It would have been possible for me to do some observations in April while I was in Lapinjärvi doing the induction period of the civil service that I’m accomplishing now – but then I just didn’t felt like observing but rather just admiring the sky with naked eye. I did also organize some public star viewings for the others who were there in the induction period with me. During the just ended season I made observations constantly during the season without having the midwinter break that I used to have often during recent seasons. It meant that the amount of observing sessions grew remarkably – during this season I had 38 observing sessions in total! Usually the number has been arond 15-20. The number of observing time was 68h and 36 m. During the season, I counted as session all nights when I did at least an observation of observing conditions. The minimum requirement for an observation of observing conditions was SQM and NELM measurement. Also the fact that it was possible for me to observe in the yard of my apartment in Sodankylä positively affectd the number of observations and observing sessions during the season. During the season that just has ended – I also took my first astrophotos, I took thise photos while I was observing aurorae. Example of these photos you can see in picture 2. I took these astrophotos with my recently bought Canon EOS 1000D and with Canon EF-S 18-55mm lens. I’m still going to observe mostly visually, but I think that I’m still going to take also some astrophotos also in the future now when I have a decent camera for that! Picture 2. Moon photographed 6.3.2012 with Canon EOS 1000D and Canon EF-S 18-55mm lens.